Tickety-boo, you're off to chop wood. Now find a squirrel and make some stew! 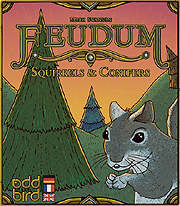 The Squirrels & Conifers expansion replaces the green goods with pink cubes (squirrels) to create a multiplying food source on the map. It also enhances accessibility for colour blind players.